Elegance combines with ultimate function in the exquisite design of the Amish Fifth Avenue Executive Corner Roll Top Desk with Hutch Top. A solid wood desk to be proud of, this office furniture combines a roll top desk with a corner frame and incredible hutch top. This wood desk keeps on giving from top to bottom, providing storage, style, display room and ample work space. The Fifth Avenue is a desk to be admired and relied on for decades to come. 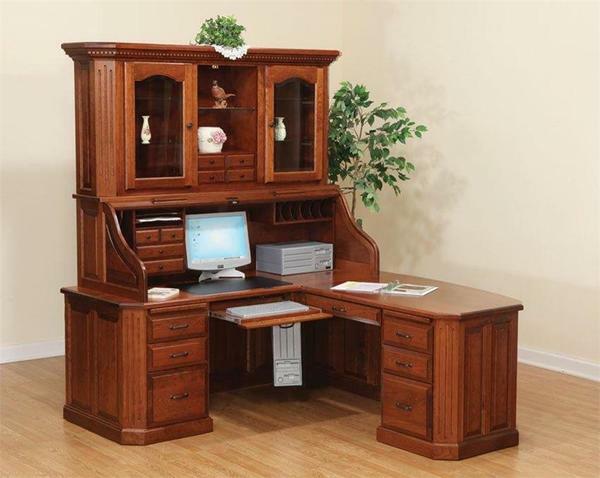 Trust the fine Amish craftsmanship of this desk to provide you with office furniture that will not have to be replaced.